Yukon Cabs are economical bolt together cabs with OEM styling. Cab is not ROPS certified, but sits in front of the existing, un-modified factory ROPS. Included in this cab are features such as a powered front wiper on a safety glass windshield, and rear safety glass panel. This cab is available with a choice of either soft or hard doors, and a color-matched ABS formed roof. Your cab can be custom configured below with these and other optional accessories. Cab height is 86 inches, measured from the ground with 27 x 8.5-15 front and 15-19.5 rear tires. Special Fit-up Notes: This cab will fit bare tractors or tractors with a 833 factory loader, and factory backhoe equipped tractors. 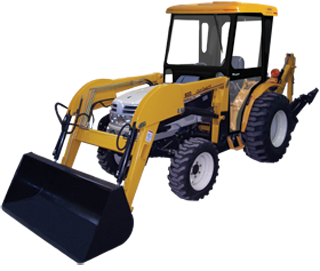 Loader tractors require the optional loader kit E32075S. Note: The optional Air Conditioning (P/N 600-4242) accessory offered below is for reference only, and is not a guarantee that this accessory fits and works with all tractor and engine combinations. Customer is responsible for ensuring sufficient engine compartment space and engine HP is available for mounting and powering the A/C compressor for their particular tractor and engine configuration.